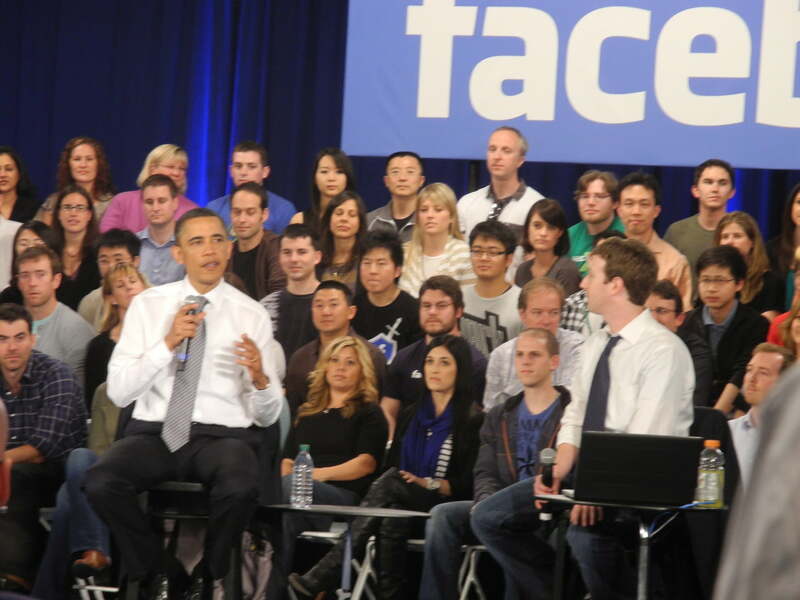 In an attempt to re-ignite the youth energy of his 2008 campaign, President Obama launched the first ever live town-hall-style meeting at Facebook headquarters in Palo Alto, California, on Wednesday. Broadcast live to the social network’s more than 500 million users, the Q&A session included questions from the live audience as well as those submitted through the event’s Facebook page. Questions were moderated by Facebook co-founder and CEO Mark Zuckerberg, who joined the president on stage wearing uncharacteristically dressy attire. During the meeting, President Obama touched on a wide variety of issues sure to play a major role throughout the 2012 campaign, including the ballooning national debt, the federal budget, health care, and the housing market. While detailing his plan to reduce the deficit, which is expected to hit $1.4 trillion this fiscal year, the president promoted his strategy of spending cuts and increased taxes on the wealthiest Americans, a group that includes both the president himself and 26-year-old Zuckerberg, who is worth an estimated $13.5 billion. “I’m cool with that,” said Zuckerberg in response to the plan. Zuckerberg, who recently donated $100 million to the Newark, New Jersey, school system, praised Obama’s education reform efforts. “I think the Race to the Top stuff that you guys have done is one of the most under-appreciated and most important things that your administration has done,” Zuckerberg said. Obama turned the conversation to the importance of quality math and science education, a topic popular with the Silicon Valley crowd. The president also backed the idea that America allow highly skilled immigrants to contribute to America’s technology industry. To conclude, Obama made his plea to the young crowd that made up the audience, both at Facebook headquarters, and those watching at home, to stay engaged in the politics of the country. “If you put the same energy and imagination that you put into Facebook into the political process, I guarantee you there’s nothing we can’t solve,” Obama said. At the end of the event, Zuckerberg made his own stylistic contribution as he presented President Obama with his signature duds, a Facebook hoodie.